Explore your "forever wild" side. 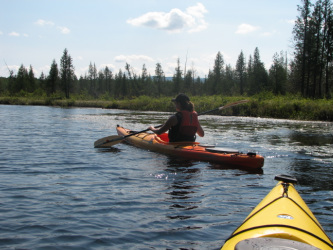 Adirondack Day trips are 5-6 hours in length and location depends on what kind of paddling experience you would like and where you are located. We have a lot of different routes to chose from, here are just a few. Please contact me directly for reservation. Please call to check availablity and to reserve your spot. Let Placid Waters Kayaking create the perfect day of paddling for you by choosing one of the many unique paddling spots in this region. Old Forge and the Fulton Chain is the gateway to a paddling trail that runs all the way to Maine so there is never a shortage of destinations to explore. The chain of lakes can be busy but gives you a good look at camps and life along the chain. Enjoy a day of paddling on this scenic and historical lake. This lake offers miles of beautiful paddling along shores dotted with old camps, interesting boat houses, trees, wildlife, and amazing views. 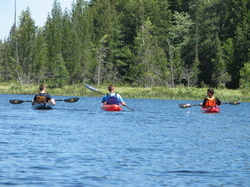 There are also side trips into remote areas such as Andes Creek and Gull Lakes. This trip can include a hike and swim if interested. At the end of a long dirt road you will find Stillwater which offers a 13 mile long reservoir with endless miles of shoreline to explore. During the summer you will find long beaches, great swimming spots, eagles, loons and herons and lots of fun places to sneak a kayak into. This trip is dependent on weather and ability. 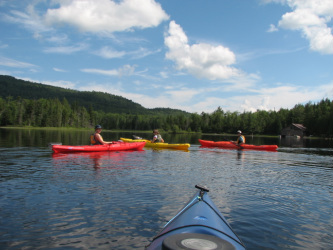 One of the largest lakes in the Adirondacks is Raquette Lake and it offers a variety of paddling destinations. One of the favorite spots is a paddle up the South Inlet to a small area of rapids, a great spot for a swim. Another longer trip will have us paddle across the lake and up the Marion River. A third choice could have us paddle to a trail head and include a hike up West Mountain.